Oh my word. What an amazing book. When people say "I couldn't put it down" - I LITERALLY could not put it down. I was supposed to be writing on Sunday but instead I downed tools and listened to this audio book from lunch time until I finished it at 11.30pm that night. Initially, I had resisted reading this book. When it first came out a couple of years ago and was a massive hit, I read the blurb and thought 'oh dear, that sounds really depressing, I'm not sure I could handle that'. I knew it was about a woman locked in a room with her son and I worried that the book would feel really claustrophobic and horrible. However, after huge recommendations from my sister, and the fact that the book popped up in audible's daily deal, I thought I'd give it a go. At first, I found it a little hard to get used to the boy's voice as narration, but by the end of the book, I thought he was a complete dote and I loved listening to his voice. Also, I think that the fact that the book is told from his childlike narration makes this book bearable. If told from the mother's perspective, I think it would have been too heart-breaking. But instead, viewing the room through the boy's eyes, we see that what would normally be oppressive and claustrophobic is narrated through his simplistic and child-like eyes. This is a book that lived in my head even when I wasn't listening to it. I began to think about real-life cases - Josef Fritzl and the terrible tragedy that his daughter Elizabeth endured. 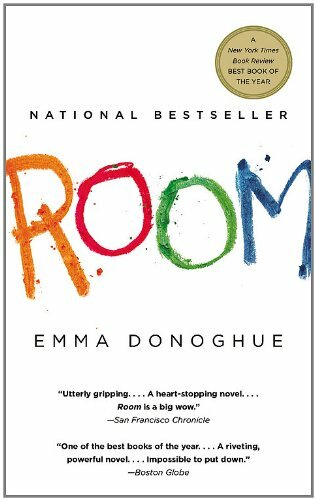 Emma Donoghue dramatises this scenario and makes us comprehend the deep deep trauma that this tale involves. It also made me think of the Stockholm Syndrome, where the boy has actually become climatised to his environment. Interesting too, that the boy's way of coping with the pain was to count. Counting his teeth. Counting the number of times the bed creaks. His OCD as a coping mechanism to deal with emotional pain. Whilst this all sounds heavy and hard-going, there is also the incredible and bond and love between the mother and boy. There is his complete reliance and trust in her. And there is bravery and courage amidst desperate struggle. I am looking forward to watching the film version as I hear from reviews that it has stayed very true to the book.